It is with great pleasure and enthusiasm that Knox College and the Institute for Christian Studies (ICS) announce the signing of a lease that will see ICS move its operations to the premises of Knox College, effective August 1, 2018. This initial lease is for a term of 5 years. 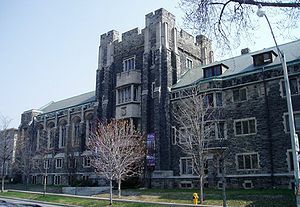 ICS’ new location will be in the northeast wing of Knox College’s lower level, in the heart of the University of Toronto’s St. George Campus. Knox College is a theological school of The Presbyterian Church in Canada, a federated College of the University of Toronto, a founding member of the Toronto School of Theology, and holds accreditation through the Association of Theological Schools in the United States and Canada. The Institute for Christian Studies is a community-supported graduate school in the Kuyperian stream of the Reformed tradition, and an affiliate member of the Toronto School of Theology. It operates under charter from the Government of Ontario to grant MA and PhD degrees in Philosophy, and the Master of Worldview Studies degree.